Last week we visited one of our favourite local haunts. I mentioned it in #40DaysofSummer last year and it even got its own blog post, Bristol does Summer, but this story has a slightly different ending. From museums, more museums, to parks, to crazy sculpture trails (this year it's Shaun the Sheep! ), there is something for even the most discerning of small people to enjoy. Now and again, we take the bus into town, to find something fun to do. Every city has its benefits and one of Bristol's is its vast array of free things to do. Including wonderful water sculptures in the fabulous surroundings of Bristol's Millennium Square. Once we get to the bus station. it's a short hop on pretty much any bus that is pointed towards Portishead or Weston to drop us off at Anchor Road, although, if you have the time, it's only a fifteen to twenty minute walk to The Harbourside. Talking of sculptures, there's a brilliant one outside @Bristol at the moment. 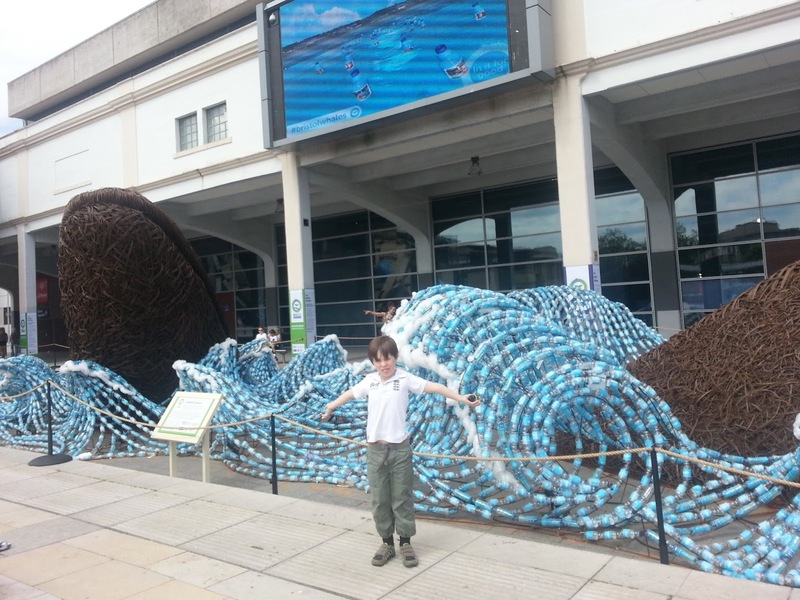 It's a huge whale, with waves made from plastic bottles and it's highlighting the amount of plastic bottles that are thrown away each year. It's really quite spectacular, and surprisingly beautiful! 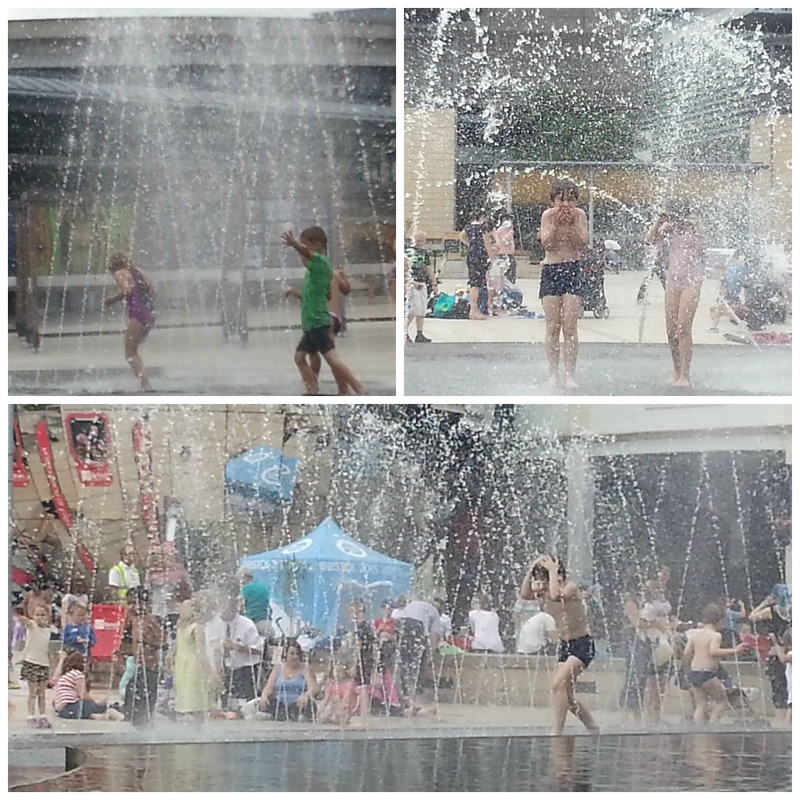 It's totally free and fantastic fun, especially on a hot day. There are benches and deckchairs for the grown ups and a lot of families bring a picnic and settle in for the day. However, there is one aspect of this yearly pilgrimage that fills me with dread. It's the sickening thud of various body parts hitting the concrete around the edge of the water. There is a design flaw in the architecture of the site that means, although the surface in the splash zone is textured, as soon as you step onto the surrounding paving next to it, it is shiny, wet, and very, very slippery. Even though L is fully aware that it is slippy and knows not to run, he still fell exiting the pool area. This was because there is a significant height difference at points around the water area, meaning he was slightly off balance stepping down onto the smooth, wet stone. So he still slipped. He wasn't badly hurt, but another, much smaller, boy fell backwards, hitting his head and it made us realise that this needs to be considered when visiting the site. So, next time we visit, L will be wearing plastic shoes or sandals, with grips on the soles. I can't recommend strongly enough that you do the same for your little ones. This is a brilliant, free attraction for children of all ages, but it's really important we keep it as safe as possible. Ouch, yes very good point! Eeee you'd think they'd have thought out the fact it wasn't going to be slippy wouldn't you! Sounds like great fun though. Looks like a great place for kids (apart from the slippiness!). 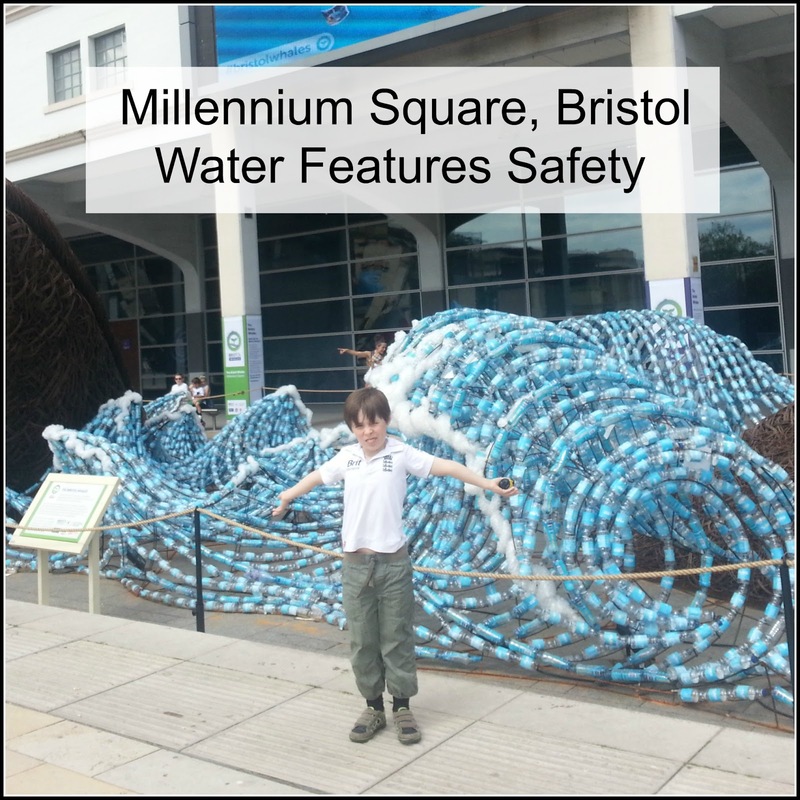 Enjoy reading your Bristol Bits - I've visited Bristol a few times and it seems a brilliant place - so much to see and do there!